LAWLESS is by far the best equipped and maintained Sea Ray 540 Sundancer on the market, and is arguably the most highly optioned 540 Sundancer built. Her equipment list is extensive with many custom additions to make her a highly capable vessel in and off shore.Below are just some of this boats features. Full exterior teak flooring, cockpit, swim platform, deck side walkways and transom steps. Salon reversed to put TV on forward bulkhead. Forward sun-pad with fold down bimini. Additional hand shower system in both heads. Additional insulation foam around air conditioners for noise and temperature control. Improved protection and termination of wiring above Sea Ray factory minimum spec. High end professional stereo system with four amps, two subwoofers, and six speakers. Fusion head unit with WetSounds amps and speakers. Cockpit and moonroof window tinting. Twin cockpit air conditioners, twin cabin air conditioners. United Yacht Sales New Jersey would love to guide you through a personal showing of this 54' Sea Ray 540 Sundancer 2012. 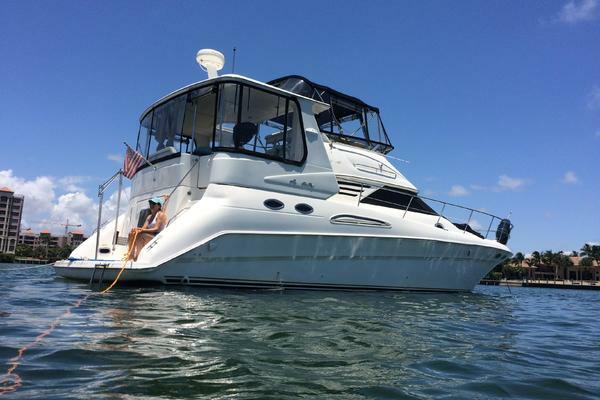 This yacht for sale is located in Solomons, Maryland and priced at $875,000. For a showing please contact us by filling out the form on this page and we will get back to you shortly! Quick Windlass with all chain rode, foot pedal and helm control. Digital TV Antenna with gain tuner.